I recently received an email from a grieving mom telling me what her husband had been dealing with as a result of losing their infant child in March of this year (2015). She went on to tell me that “she knows its silly, but she feels her daughter’s spirit when she is around butterflies.” Of course I told her it wasn’t silly at all and that I too feel a sense of peace when I see a butterfly (Katie) and when I see a dragonfly (Noah) since both of them remind me of Katie and Noah. Her comment reminded me of an article I wrote back in 2011 before my book was published about this very topic. It’s been 4 years since I wrote this article, but I still feel that same peace when I come across one of these beautiful creatures. About a year ago, I was out for a walk with my wife and I saw this small beautiful bright blue dragonfly sitting on a wooden bridge that went over a peaceful stream that we were enjoying. I held out my hand and the dragonfly moved and landed on the back of my hand and sat there for several minutes. I choked up but I felt it was Noah just saying hi to his dad. I hope you enjoy this classic article and please share any of your personal stories. Peace. It must have been a couple of weeks after the death of my son Noah when I first noticed the dragonflies. It was mid-June 2006 and I had already been off work for several weeks. I had called my office to let them know that I wasn’t going to be in for a while. At the time I didn’t know what “a while” meant and thankfully they didn’t ask. I spent most of my days doing small tasks around the house, just to keep my mind occupied. The rest of the time I hung out with my wife, worked out and made lunch on the grill every day. I was still trying to process what had happened to us and really hadn’t started to feel the full impact of the depth of my pain from the death of my son and my daughter just 18 months prior. This particular day I decided I was going to start staining my fence. I wasn’t in a hurry because I knew I didn’t have anything else that had to be done anytime soon. So I just took my time and tried to enjoy the beautiful summer day. This was the first summer I had off from working or college since I was probably 14 years old. I had forgotten how nice it was to be able to get up when you wanted to and spend the day doing what you wanted to do versus what you had to do. However, I was still trying to comprehend what had happened to my wife and me. The loss of two children over 18 months had inflicted major depression and anxiety that wouldn’t allow me to do much of anything other than small tasks. Even the small tasks were exhausting. While I was taking a break sitting under the shade on my patio, I noticed two dragonflies hovering around my backyard. They were not just passing through my yard; they seemed to be hanging out for a while. I don’t live near water and I had never noticed them before, but I enjoyed watching them that day. The next day I got up around 9 o’clock, which was typical for that summer. I was usually up until about midnight and obviously needed the sleep to cope with the pain I was dealing with inside. When I went outside to start working on my fence, the dragonflies were there to greet me. The dragonflies and I spent the rest of the summer hanging out in my backyard. I started to have other experiences with dragonflies during this same time. I live near a bike path that leads to a local forest preserve and would often ride the 12 mile loop as part of my daily workout. There were times when I would be riding and thinking about my son when a dragonfly would appear out of nowhere and would fly along with me at the same speed. He would fly about 3 or 4 feet away from me, but would stay with me for a while. I would just smile because I thought it was Noah letting me know he was ok.
It’s been just over 5 years since the loss of Noah, but because of these experiences, I think of Noah every time I see a dragonfly and I just smile. 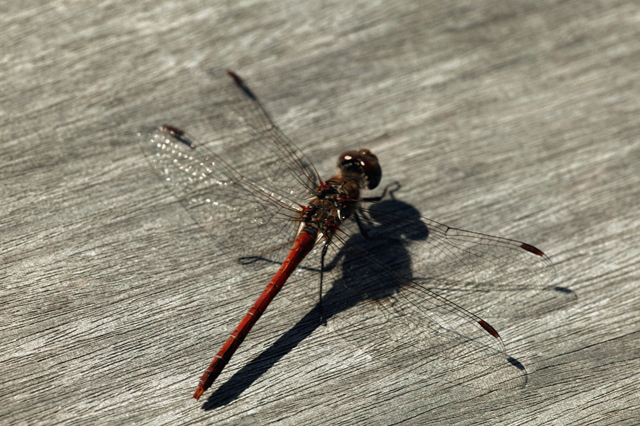 On a recent bike ride on that same trail I came upon a swarm of dragonflies, the big ones with the double wings. There must have been over a hundred of them in a fifty foot radius anywhere from 4’ to 12’ off the ground. I stopped my bike and I just stood there in the middle of this swarm. They were beautiful. They must of known I was there because they would stop 2-3’ in front of me and look at me. They would fly slowly by to let me know they were aware of my presence. This had to be one of my best experiences in a long time. I must have stood there for about 15-20 minutes watching them. I even called my wife to tell her about what I was experiencing. I felt close to Noah when I was standing there with those dragonflies. I think it was just his way of visiting his daddy and to let me know he was thinking of me. I have met several grieving dads (and moms) over the last several years that also have similar personal stories when it comes to our children visiting us. There have been other signs from Noah, but this particular one was spectacular. Does your child send you signs? If so, what are they? If not, do you keep yourself open to seeing signs? Andrew – What you are feeling is completely normal. I was never suicidal either, but I there were time I didn’t care if I woke up the next day. Sometimes you just want to be at peace. Other times, you just want to see and hold your child again. I hope yesterday was kind to you my friend. Peace. For me it’s blue jays. My son Daniel died on Nov. 3, 2009 and for the next week blue jays kept coming around my house. I was even sleeping soundly in the basement 1 morning & could hear 1 outside so I got up & looked out my window & there was 1 right on my deck! I said: “Daniel is that you my son?” & though I never heard any voices I had the feeling that he was telling me he was OK & that he had not forgotten me. I still get that feeling every time I see or hear a blue jay. Just tonight before the sun went down, 1 called from a nearby tree & again I thought of him saying he is aware of my upcoming feelings of sadness next month & was letting me know in advance that he is OK. Thanks for your posts. I also have friends who lost a son in 2006 & the mother says for her it is also dragon flies. Take care. Dan – Thank you for sharing you story. Funny thing happened to me over the weekend, I was back in my home state of Iowa visiting with family. As we were sitting in the living room, something caught my eye through the window. It was a big Blue Jay, sitting on a low branch of a small tree. Its been years since I have seen one of these beautiful birds. We see what we interpret as signs frequently. Shortly after Jake died, we started seeing rusty brown and green Allen’s hummingbirds everywhere. On walks, at our friends cabin in Ojai where we went during that first horrible year for a little solace, in our own garden bathing in the fountain and resting in the redwood tree, and recently they have returned en masse to our yard. We also see huge orange dragonflies who come and sit in our apple tree for long periods of time. Occasionally, there are confluences of events that seem to defy coincidence and when something like that happens, I can only smile and softly say to myself, “Jake”. Great story and thank you for sharing. Although I don’t connect hummingbirds to Katie and Noah, I have seen a lot more of them around in my yard this past year. Next time I see one I will think of you and Jake. I know what you mean by the smile, I respond the same way combined with a feeling of peace. It is like my brain stops thinking about whatever its thinking about and just focuses on the moment and the connection I am having with my child. Thanks again for sharing! For me it’s the rain. It was raining off and on when we lost our darling daughter, and since then it is amazing how often it rains just when I need a sign that Katie is ok or that I’m feeling really down. Others curse the rain but to me it is always a blessing. I must look mad standing in the rain but to me its a big hug from may darling, especially warm summer rains. I was recently diagnosed with cancer and on that day, when I got the terrible news that its not really treatable, my darling came and spent the day with me. It rained all day and sung me to sleep that night. I plan to join her in the rain when my time comes, and hope I can comfort my family in this way. Andrew – Thanks for sharing your story. What a great way to feel you child’s presence, standing in the rain. I am so very sorry to hear about your diagnosis, it must have given you great comfort to know that your daughter was right there with you. Tomorrow is 6 years since I lost my darling and against all odds my cancer is stable and I may live 10 more years. Instead of being happy I’m crushed as I fully thought I’d be with her by now. I have never been suicidal, and would never take my life, but it seemed like such a nice solution to just be allowed to die. I would not want to do that to my wife or other kids, but I hope you and others here might understand what i mean by this. It sounds so terrible even thinking it and I know almost no one would understand. I came back to reread this post as I find great comfort in it, and as I sit here typing and crying (luckily by myself in my office) there is a sun shower outside. I just needed to put this out to the universe, and although everyone means well, very few actually understand. Thanks for being a place to go.